In addition to delicious flavor, PEI Mussels bring a healthy serving of nutrients to the table. PEI Mussels are a good source of vitamin C, which is rare among protein sources. A 75 gram serving of mussels provides 10 milligrams of vitamin C. Compare this to a 100 gram size serving of watermelon cubes which provides 9 milligrams. Protein helps develop antibodies as well as build and repair the body tissues. That’s essential to note for anyone looking to add seafood to a fitness diet. An average serving of PEI Mussels has 18 grams of protein. PEI Mussels are also an excellent source of iron, a factor in red blood cell formation. An average serving of PEI mussels has 5 milligrams of iron. Fruits and vegetables can't take all the credit when it comes to providing antioxidants – mussels have them too! PEI Mussels are very high in zinc, which plays a big role in the body's energy metabolism. 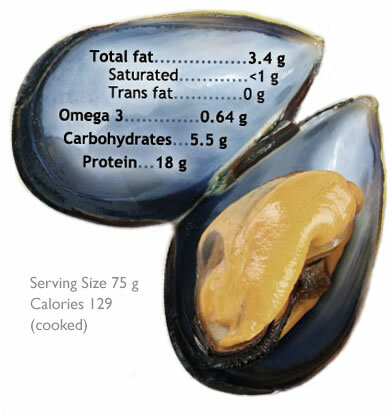 An average serving of PEI mussels has 2 milligrams of zinc. PEI Mussels are an excellent source of selenium, a mineral that is considered a dietary antioxidant involved in the formation of a protein that defends against oxidative stress. Other important vitamins and nutrients found in PEI Mussels include: phosphorus, manganese, riboflavin, thiamine and vitamin B12.